Chris Christie made his 2016 Presidential Campaign official yesterday - giving his announcement speech at the high school from which he graduated. Many people, including the New Jersey Governor himself, have described his style as "plain-speaking" and "blunt" (e.g., "... I mean what I say and I say what I mean ..."). This is political-speak for a "working man's sincerity" in attempt to court "the common person's vote". What follows is a partial nonverbal analysis of his speech. From a body language perspective, Christie very commonly not only projects an alpha emotional tone - but is often quite hyper-alpha. His paralanguage and his verbal communication are also similarly more extreme. Of course Governor Christie may still be very sincere and plain-speaking without being hyper-alpha, overly-aggressive and out-right angry. He is confusing the two qualities of anger/assertiveness with sincerity/plain-speaking - as if they were two parts of the same whole - yet of course they're not. Chris Christie can still be blunt and sincere without getting angry. At the 16:35 mark, Governor Christie continues, "... America is tired of hand-wringing and indecisiveness and weakness in the oval office. We need to have strength and decision-making and authority back in the oval office and that is why today I am proud to announce my candidacy for the Republican nomination for President of the United States of America! ..."
It is curious (and ironic) that in this particularly important paragraph Governor Christie uses the nonverbal metaphor of "hand-wringing". Hand-wringing in both body language and common speech conjures up images and emotions of indecisiveness, emotional dissonance and anxiety. Yet for much of this speech Chris Christie paces back and forth across the stage in what also signals similar anxiety and inner-conflict as well as the "bleeding" of nervous-energy. He is criticizing others for worrying (outwardly and inwardly) while he himself is doing that exact same thing - and telegraphing it too. It is never good to use any body language too often. Over-doing anything will inevitably back-fire. 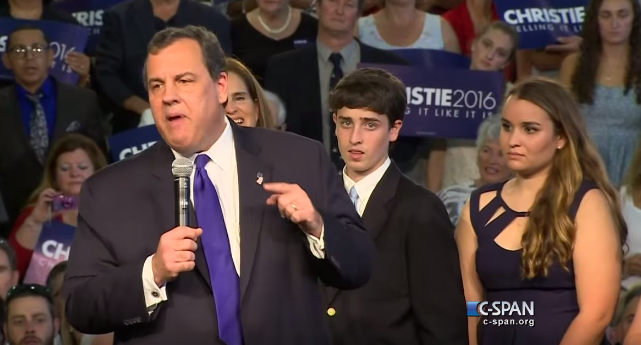 Chris Christie should have had a wireless microphone so as to have both hands free (during this or any speech). A hand-held microphone engenders monotonous behavior with the free hand. Index finger (forefinger) pointing is cross-culturally and universally negatively received. It makes people feel berated and belittled. It destroys rapport and will cost votes (it does however make it's user feel powerful ... while it simultaneously up-regulates the users anger). The Governor moreover amplifies this negative nonverbal even further by his dramatic and repetitive use of the hand-chop - thus becoming a "finger-point hand-chop" illustrator. This is one of the worse nonverbals signals anyone can use (even in a highly-partisan, hand-picked crowd such as this setting). Christie's courted the center-leaning voters during his last gubernatorial race - which served him well. He may be well served by a similar strategy in such a crowded republican presidential primary. However by using such anger and hyper-alpha qualities expressed in his verbal language, paralanguage and body language - will dramatically reduce his ability to win the his party's nomination. Governor Christie - you can be both plain speaking and blunt without being angry and aggressive.